The funeral yesterday of William Eccleston, the sporting publican, who was known to a great public in London and Brighton as ‘'Jolly Jumbo” was an East End event. It was at Manor Park Cemetery. The body was brought from Brighton by motorcar, accompanied by motors with mourners from many of the Brighton inns. 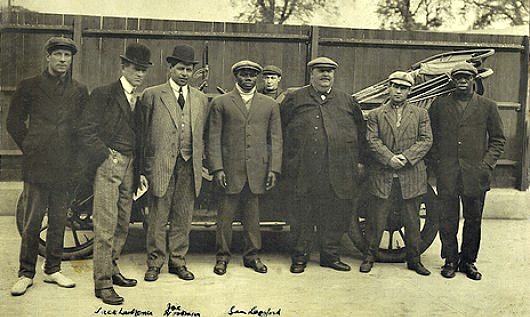 It was a curious gathering of many sections of sporting society—publicans, bookmakers, billiard players, pugilists, and horsey men of a type that is fast disappearing. There were many ladies in dark furs, velvets, and mourning hats, but as Eccleston had been some years out of London and many of his connections here had been severed the crowd was less than expected. Some were brought by curiosity to see the interment of this modern Daniel Lambert, whose coffin was over seven feet in length and nearly three and half feet in breadth. It was borne by ten bearers, and the greatness of the strain could be seen in the condition of their collars when their task was over. Among the assembly were some who followed the ceremony with curious connoisseurship. One of these, a woman, who noted that the widow in her agitation had thrown the wrong wreath into the grave, said that that it was ‘bad luck.’ From the demeanour of the chief mourners there was no doubt of the misfortune that had befallen them. Appreciation of the loss was unaffectedly shown by several of the rough-looking men who stood in the background. One man with a hard-bitten face and colour of a mulberry, who wore a muffler tightly tied round his neck and stood with his hands to his side like one who was used to sudden encounters, seemed least likely to show emotion. He looked like a bookmaker’s runner or a ‘Charley’ who took chance jobs outside a tavern. As the earth fell on the coffin he choked and there were tears on his cheeks. This world must have become a bleaker place to many when ‘Jolly Jumbo’ was gone. Jolly Jumbo was not quite as comfortable with his weight as his nickname implies. 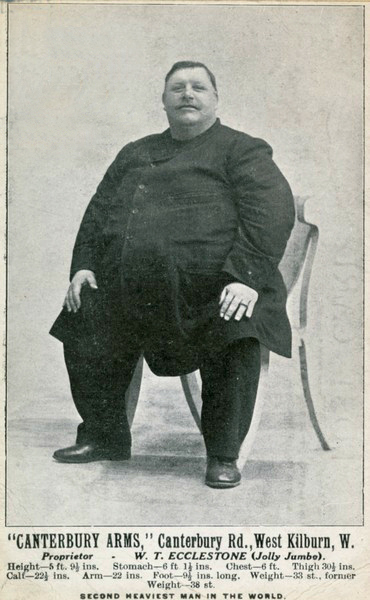 In 1905 he was interviewed by the newspapers after the death of fellow publican Thomas Longley of Dover, whose gargantuan 46 stone made him officially the Kings Heaviest Subject. Following Longley’s demise Jolly Jumbo inherited the honorary title and merited a few column inches. "In my opinion no man ought to weigh over 18st, and I cannot see where the 'jolly' comes in when a man is over that weight," Eccleston frankly told the reporter. "Now, I am talking from experience, being the King's heaviest subject, but had I the choice I would rather be his lightest, when I should not require the doors made larger, or when travelling have to go in the guard's van. In the presence of my friends I am jolly, but when I have to wait to have my boots put on or taken off I often have the hump, and wish someone else could have the jolly fat instead of myself. My opinion of fat is that it is a disease, and no good to anyone." In 1910 the public would have been astonished to learn that Jolly Jumbo was planning on taking to the air in the company of pioneer aviator Claude Grahame White early in the new year in aid of charity. The proceeds of the flight were to go to the Willesden Cottage Hospital; Jolly Jumbo was hoping to raise enough to endow four new beds. He told the papers "I shall go up with Mr. Grahame White or any other pilot without the slightest hesitation, and be glad of the chance. I'm the heaviest man in Britain, and I have an ambition to take my big weight into the skies. You may be sure the event will come off." The confidence was misplaced, the plan seems to have been abandoned; perhaps Jolly Jumbo was just too much for Grahame White’s plane. Yesterday Jolly Jumbo, whose home is the Chequers, Alperton, was the presiding spirit the London Cabmen and Busmen’s Charity Festival at Wembley Park, which is held every year under his superintendence in aid of the Willesden Cottage Hospital. “The greatest show ever presented,” said the flaming poster at the railway station; and nobody disputed the fact when he beheld Jolly Jumbo, ”the man who turns the scale at 40 stone and is still able to walk.” When a Daily News representative found himself breathing the pellucid atmosphere of Wembley Park yesterday the first thing he saw was “Jolly Jumbo” with his panama saucily tilted over one eye, running amok in his specially made horse-trap among the sightseers who had trespassed into the enclosed ring on the sports ground. Cracking his whip he plunged through the surging mob and ordered them outside. Meanwhile nobody was paying attention to the cabbies’ go-as-you-please race that was being run round the track. ..... A terrific bang, as if a fenian hand were trying to blow the Watkin Tower, caused a commotion in another part of the field. The Wembley Stakes had commenced, and prize whippets, such as Annie Laurie, Spider, Little Jim, Don’t Know, Wet, and Coronation, were flying over the I50 yards handicap like lightning. Another explosion, more terrific than before, and the rabbit coursing was in full swing. Splash! and cabbies and busmen in regulation swimming costume were ploughing through the waters of the lake. There were foot races for old and young, obstacle races with an eleven foot jump at the finish, cycle races on the gravel track, which, after the heavy rains, resembled in parts a ploughed field; bucket, costume, and sack races, grand wrestling bouts in the variety hall, and tugs-of-war between drivers and ostlers, each of the winners receiving a silk handkerchief. It went on from eleven o’clock in the morning till nightfall. "Five hundred competitors,” said the programme, “eight hours continuous pleasure.” Next to Jolly Jumbo, the hero of the afternoon was Cabby Chirgwin, who won the first prize of two guineas and an oxidised silver shield for the best equipped hansom cab and horse. A rousing cheer greeted him when he drove past the grand stand, in his picked green and white cab drawn by a beautiful roan mare. His number was 14,317, and in his immaculate top hat and red and white everybody proclaimed him the smartest cabby in London. The display of hansom cabs was one of the finest on record. There were special prizes lot the smartest-looking drivers—new hats, opera glasses, bottles of whisky, and boxes of cigars. 'The only jarring note of the day’s fun was the hoarse-throated uproar of the betting men in front of the grand stand, who were allowed to do a brisk business, despite the prohibitive notices placarded all over the field. And far away in a leafy corner of the grounds, almost beyond earshot of the crowd, a band was wasting its sweet cadences on the desert air. But a roundabout organ in the next field suddenly struck up, “Oh, listen to the band” completely drowning its rival. For half an hour without a stop that organ was crashing out, “Oh, listen to the band” and it was still when our representative left. According to Probate records Jolly Jumbo left an estate worth £6717 17s and 6d to his widow Anne. She later remarried and only died, at the age of 89, in 1955. 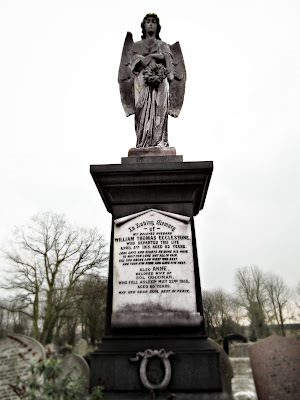 The grave inscription insists she was the “beloved wife of Sol Goodman” but she choose to be buried with Jolly Jumbo not her second husband and she joined him in Manor Park after a forty year separation.